Thanks to those making the AVTTS presence in the Canada Day parade with special mention to Helen and Barry Thomas who spearheaded the effort, bike trailer and all, and who brought on grandson Seb who carried the colours for us. Marcus, John and I rounded out the small, but dedicated, team. As a general rule, attempt wherever possible to harvest smaller, younger leaves, or take a moment to remove the midribs of the kale. Fresh kale from your own garden is the best, and Red Russian Kale, also sometimes known as Ragged Jack, tends to be more tender than some other varieties. I like to have a feed of Black Tuscan Kale from time to time (I have to grow it), but it’s not as tender as Red Russian and the midribs are really stringy. It makes great chips. 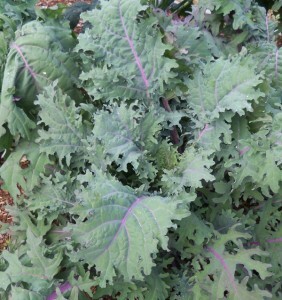 There are also some decorative versions of kale to be found in seed catalogues. I am informed that the red varieties are more frost-hardy than the green (note that Red Russian is really a green variety, try Redbor for hardiness). Tear the leaves from a bunch of washed and dried kale into bite-size pieces. Toss with a thin drizzle of extra-virgin olive oil (a couple of teaspoons will do) and massage lightly into the leaves. Sprinkle with a pinch of salt, tossing to distribute. Or leave out the salt and add the seasoning of your choice, such as curry powder, smoked paprika, or whatever you have on hand. Arrange leaves in a single layer on two large baking sheets. Bake at 350°F (180°C), switching baking sheets halfway through, until crispy and dark green (not brown), 12 to 15 minutes. Let cool slightly and dig in. When kale plants overwinter, they will sprout back in the spring with both leaves and flowering heads that resemble small broccoli florets. I usually reserve a couple of plants for seed production and harvest the others as they start to produce heads. The heads will snap off where the stalk is still tender, so all that you take should be edible. I give them a quick wash and set them on a towel to shed some, but not all of the wash water. I then take a frying pan, heat it, add an oil that will take some heat (peanut or grapeseed, usually), peel and slice in some fresh garlic, and before the garlic turns colour, I toss in the slightly moist kale flower stalks, turn them to mix in the oil and garlic, then put a lid on for a minute or two. The stalks are better if not overcooked. Quite often, I’ll dress the stalks with either soy or a bit of balsamic vinegar, or a little coarse salt and lime juice is quite tasty. A naughty version of the vinegar dressing adds in some shaved pancetta. Kale makes a decent soup on its own with the addition of vegetable or chicken stock. Tear or chop the kale finely and add to hot stock for a minute or two before serving. The addition of sauteed onion or garlic enhances the flavour, and the addition of other vegetables, particularly carrots, turnips, rutabaga or potatoes, makes for a soup with more apparent substance. Kale is a fine addition to bean soups as a sort of hillbilly pistou, and of course, processing in a food processor to make thick soups means that just about anything goes, including the addition of curry spices or peppers and cilantro. Kale would be a potential ingredient in gazpacho. Layer the usual lasagna noodles with layers of the usual cheeses, but substitute steamed kale for the bolognese sauce, or simply add in layers of steamed kale with the sauce that you normally use. This is an Irish specialty, basically mashed potatoes with the addition of finely chopped steamed kale mixed into the potato mass. Again, a naughty version adds bacon or ham for a little extra flavour. Here is a case for using very fresh young leaves torn into a green salad in a proportion that suits your taste. Along with kale, we often add turnip or radish greens, mizuna, Good King Henry (an old perennial English potherb that we keep in the garden), nasturtium leaves, buds and flowers, sorrel, miner’s lettuce and whatever other succulent leaves we can find. Kale seed can be sown outdoors shortly after last frost. Plant in shallow furrows in fine soil and cover lightly. I find that seeds almost all germinate, so sowing single seeds at 3 cm. intervals does away with a lot of the thinning. Be sure to munch on any thinning as the young plants are tender and tasty. Plants can eventually, given sun, water and decent soil, grow to over a meter tall and bush out to 30-50 cm. Individual leaves can be harvested from larger plants. Plants can be protected from frost and harvested well into winter, or, if mulched, may lose their leaves, but will sprout flower heads in the spring before going to seed. Happy growing. The more of your own food you grow, the more resilient you will be, and generally healthier as well.